The Chinese international market is experiencing rapid growth, driven by aggressive expansion from Chinese airlines. Foreign airlines have been steadily losing market share in China and the profitability of their Chinese routes has been on the decline. Chinese airlines grew international passenger traffic by 14% in 2018 and have more than doubled international passenger traffic over the past five years. There are now 29 Chinese airlines competing in the international market, compared with 12 airlines five years ago. This summer there will be 12 Chinese airlines operating long haul passenger flights, compared to only four airlines five years ago. Chinese airlines have launched more than 30 new long haul routes over the past year, resulting in intense competition for both local and sixth freedom traffic. Competition has also intensified on short/medium haul routes within Asia due to rapid expansion from Chinese airlines, pressuring yields as capacity increases have outstripped rapid demand growth. Another surge of new routes (within Asia and long haul) are planned for 2019, resulting in a gloomy outlook for yields and profitability in the Chinese international market. The number of Chinese airlines operating international services has grown from 15 to 29 over the past three years. The number of Chinese airlines operating long haul services has grown from four to 10 over the past four years and will reach 12 this summer when Juneyao and Shanghai Airlines launch services to Europe. Chinese airlines grew international seat capacity by 15% in 2018 and have more than doubled international seat capacity over the past six years. Foreign airlines have grown in China at a much slower pace and for the first time in 2018 they accounted for less than half of international seat capacity to/from China. Chinese airlines are pursuing more rapid international expansion in 2019, which will impact foreign competitors as yields and profits are further pressured. There are now 29 Chinese airlines operating international services (based on OAG schedule data for the week commencing 25-Feb-2019). At the moment there are only 11 airlines in China that operate entirely in the much larger domestic market. Collectively, Chinese airlines have seven times more seat capacity in the domestic market (14 million weekly domestic seats compared to 2 million international seats). The three largest airlines in China (Air China, China Eastern and China Southern) account for 61% of international seat capacity from Chinese airlines, or 33% of total international seat capacity (when foreign airlines are also included). Each of these airlines has well over 100 international routes and is relatively similar in size. Another three airlines (Spring Airlines, Xiamen Airlines and Hainan Airlines) have at least 100,000 weekly international seats and account for another 12% of the international capacity generated by Chinese airlines. The remaining 18 competitors all have small international operations, less than 20,000 weekly seats, and combined account for 12% of the market. None of these smaller competitors has more than a 1% share and 14 of them have six or fewer international routes. Note: Seat share based on share of total seat capacity operated by Chinese airlines (does not include foreign airlines) for week commencing 25-Feb-2019. Only routes originating in China are included; fifth freedom sectors are excluded. A staggering 14 of the 29 airlines have launched international services over the past three years. China Express Airlines, Loong Airlines, Tibet Airlines, West Air and 9 Air began international services in 2016 (based on OAG data). China United Airlines, Chongqing Airlines, Donghai Airlines, Hebei Airlines, Kunming Airlines and Ruili Airlines launched international services in 2017. Chengdu Airlines became the latest Chinese airline to launch international services on 19-Jan-2019, when it began three weekly flights from Chengdu to Samui in Thailand. Over the past five years, 17 Chinese airlines have started international services. Beijing Capital Airlines began international services in 2013, followed by Lucky Air and Okay Airways in 2014. All 12 of the Chinese airlines that were already operating international services five years ago have also pursued rapid expansion. All 12 grew international seat capacity in 2018, with growth rates ranging from 5% to 26%. All 12 have also grown international seat capacity by at least 60% over the past six years. The three Chinese majors have grown at the slowest rate on a percentage basis but have each added 8 to 10 million annual seats. The nine medium sized airlines have grown at a faster rate but on a small base, adding at most 5 million annual seats. Chinese airlines have grown faster than foreign airlines and now account for more than half of total international seat capacity in China. Chinese airlines overtook foreign airlines for the first time in 2018 and accounted for 51% of total international seat capacity. In 2017 they accounted for a 49% share. In 2012, Chinese airlines only accounted for a 42% share of total international seat capacity to/from China. Foreign airline seat capacity in China increased by 7% in 2018, whereas Chinese airlines grew international seat capacity by 15%. Over the past six years foreign airline seat capacity has increased by 55%, while Chinese airlines have increased seat capacity by 122% (more than twice as fast). Chinese airlines flew 74.94 million international passengers in 2018, representing a 14% increase compared to the 65.71 million carried in 2017 (based on CAAC data). This includes a 10% increase in Hong Kong, Macau and Taiwan traffic to 11.27 million passengers and a 15% increase in other markets to 63.67 million. In 2012, Chinese airlines flew only 31.5 million international passengers (including 8.3 million to/from Hong Kong, Macau). The CAAC does not report traffic data for foreign airlines and only provides a figure for all Chinese airlines combined (without any breakdown by airline) and breaks the combined Chinese airline traffic figure down into three segments (domestic, Hong Kong/Macau/Taiwan and "international"). Domestic passenger traffic has grown at a slower rate than the CAAC's international segment (excludes Hong Kong, Macau and Taiwan) for six out of the past seven years. 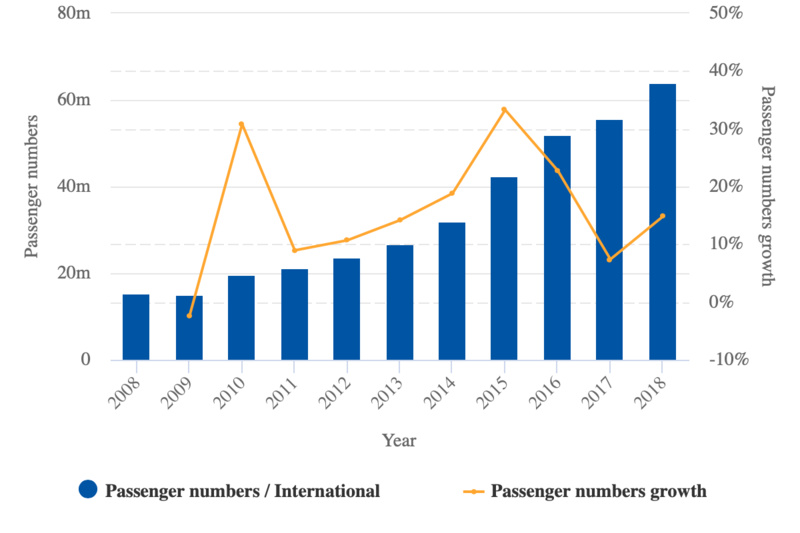 Domestic passenger traffic in China has grown by 160% this decade – from 210.60 million in 2009 to 548.05 million in 2018 – whereas international passenger traffic (excludes Hong Kong, Macau and Taiwan) has grown by 332% – from 14.74 million in 2009 to 63.67 million in 2018. This reflects the increased focus on the international market, in line with Chinese government aspirations. Source: CAPA - Centre for Aviation & CAAC. In the above graph Hong Kong, Macau and Taiwan are excluded. In all other tables and graphs in this report Hong Kong, Macau and Taiwan are included in the international figures because these are categorised as international by CAPA and OAG. Chinese airlines are again expanding more rapidly than foreign airlines in 2019. Based on current weekly seat capacity data, the Chinese airlines share of total international seat capacity has reached 53% compared to 47% for foreign airlines. The rapid expansion of Chinese airlines is having a major impact on foreign airlines. While demand for international services to/from China continue to grow rapidly, the huge influx of capacity from Chinese airlines have pressured yields, impacting the profitability of foreign airlines. There are 129 foreign airlines serving China (based on OAG schedules data for the week commencing 25-Feb-2019). Cathay Dragon is the largest, followed by Korean Air, Asiana, Hong Kong Airlines, Thai AirAsia, All Nippon Airways, Thai Lion Air, Air Macau, Scoot and (Malaysia) AirAsia. Note: Capacity share based on total seat capacity (including Chinese airlines). All these foreign airlines are heavily exposed to China and have been impacted by aggressive expansion from Chinese competitors. One good example of how Chinese competitors have impacted a foreign airline is Scoot. China is Scoot's largest international market, currently accounting for 18% of its total seats and 23% of its ASKs. Scoot's Chinese routes have historically performed well, leading to rapid expansion. However, Scoot was in the red in the first three quarters of its current fiscal year (which ends 31-Mar-2019) and is expected to end the year in the red for the first time in four years, due partially to a swing in its performance on China routes. The impact on foreign airlines is not limited to the local China market. Chinese airlines have started to compete aggressively for sixth freedom traffic, impacting other markets such as Australia-Europe and Southeast Asia-North America. It is not unusual for Chinese airlines to offer return fares below USD600 in these markets. Chinese airlines have started to pursue more sixth freedom traffic in an attempt to fill a surge in long haul capacity that far outstrips local demand. There are now 10 Chinese airlines operating long haul services (Europe or North America), compared to only four airlines four years ago. The six new entrants are: Beijing Capital, Lucky Air, Sichuan Airlines, Shenzhen Airlines, Tianjin Airlines and Xiamen Airlines. Two more new competitors, Juneyao Airlines and Shanghai Airlines, are planning to begin long haul services in Jun-2019. Juneyao plans to serve Helsinki from Shanghai and Shanghai Airlines plans to serve Budapest from Shanghai. The six new entrants currently operate a combined 14 routes to Europe and 10 routes to North America. Five of these airlines also serve Australia (which does not necessarily qualify as long haul, depending on the definition and the specific route). Donghai Airlines also began serving Australia in 2018 but only serves Darwin using 737 narrowbody aircraft. Donghai is therefore not included among the 10 airlines currently operating long haul services. Over the past year Chinese airlines have launched 24 routes to Europe, four routes to the Americas and six routes to the Middle East or Africa. More routes to North America would likely have been launched if it had not been for bilateral constraints. Chinese airlines also have launched more than 120 new international routes within Asia over the past year. While this is a huge figure, these routes are mainly to markets that have experienced a large increase in Chinese visitor numbers. Outbound demand from China is growing rapidly as the number of Chinese travelling abroad is increasing rapidly. However, in some markets the number of seats is increasing faster than demand. This is the case in some regional international markets but the most acute examples are in long haul markets. The risk of new routes within Asia is also significantly lower than of new long haul routes as they can be operated with narrowbody aircraft. Most of these routes rely mainly, or entirely, on block bookings from travel agents selling holiday packages, further reducing the risk. Note: based on routes operated from China, week commencing 25-Feb-2019. Fifth freedom sectors not counted as separate routes. A large portion of the long haul growth has come in secondary cities where it is particularly difficult to achieve profitability. Most demand still comes from the main cities. As a result airlines have to stomach low load factors and yields when launching long haul routes from secondary cities. In many cases launching long haul routes from the four largest cities is not an option due to Chinese policies limiting competition on existing long haul international routes. New routes from primary Chinese cities to smaller unserved long haul destinations is an option but again there is generally a load factor and yield issue on these routes. Focusing more on the international market and increasing average sector lengths is sensible given Chinese airlines have a much lower mix of international and long haul seats compared to their peers in other regions. However, such expansion is more strategic than profitable. There are 14 airlines in China that currently operate widebody passenger aircraft. However, only four of these airlines operate more than 15 widebody aircraft: Air China, China Southern, China Eastern and Hainan Airlines. Of the other 10 airlines operating widebody passenger aircraft, six currently operate long haul services (Sichuan Airlines, Xiamen Airlines, Beijing Capital, Tianjin Airlines, Shenzhen Airlines and Lucky Air). Three only operate international services within Asia (Shanghai Airlines, Tibet Airlines and Juneyao Air) and the fourth (Suparna) only operates domestic services. As highlighted earlier in this report, Juneyao Air and Shanghai Airlines are planning to launch long haul services later this year. Juneyao took delivery of its first batch of widebody aircraft – three 787-9s – in late 2018 and is using the new type on domestic and regional international services before the start of long haul operations. Shanghai Airlines also took delivery of three 787-9s in Sep-2018 and recently announced the launch of Budapest in Jun-2019. For several years Shanghai Airlines has operated a fleet of A330s on regional routes within Asia. Suparna Airlines took delivery of its first 787-9 in Feb-2019 and is intending to use the new type (it has three more 787-9s on order) to launch long haul passenger services to North America, as well as medium haul services within Asia. However, Suparna has not yet announced any long haul routes and is currently using the recently delivered 787-9 on domestic services. Suparna previously operated one 787-8, from Nov-2017 to Jul-2018, but only used the aircraft for domestic flights before returning it to parent Hainan Airlines. Suparna currently only operates passenger services in the domestic market, although it has long haul cargo services using 747Fs. Another three airlines that currently operate all narrowbody fleets have widebodies on order (Ruili Airlines, Donghai Airlines and Okay Airlines). It is likely that these airlines will launch long haul services within the next couple of years, further expanding the number of Chinese airlines with long haul passenger services. As previously mentioned, Donghai is the only Chinese airline with an all-narrowbody fleet that is currently operating any routes outside Asia. Its only route outside Asia is between Shenzhen and Darwin in northern Australia, which is approximately six hours flying time. Donghai has been intending to launch long haul routes since 2016, when it ordered five 787-9s (which have not yet been delivered). Chinese airlines are expected to continue pursuing rapid international capacity growth, supporting the government initiative to grow the international market. This expansion is strategic rather than profitable, particularly in the long haul segment. In the first two months of 2019 Chinese airlines secured CAAC approval for over 50 new international routes and submitted applications for more than 120 new international routes. Not all these routes will be launched (typically Chinese airlines do not launch a large proportion of their approved new routes). However, 2019 will clearly be another year of rapid international expansion for China – and another year in which Chinese airlines grow faster than foreign airlines. Another year of high double digit international capacity and passenger growth will drive more rapid growth in the most popular holiday markets for Chinese residents (such as Thailand, Japan and Vietnam). However, the capacity growth is likely to outpace local demand growth, forcing Chinese airlines to be aggressive with fares in order to stimulate demand and woo passengers away from foreign competitors. Chinese airlines will also need to pursue more sixth freedom traffic, again wooing passengers away from foreign competitors with very low fares. The impact on foreign airlines is a concern. Airlines from all the major regions will be impacted, including from Australasia, Europe, Africa, the Middle East and the Americas. However, the biggest impact will be on other Asian airlines, particularly airlines from Southeast Asia and other parts of North Asia (Hong Kong, Japan, South Korea and Taiwan). Southeast Asian airlines have already been impacted in recent years by intensifying competition within Southeast Asia (mainly from LCCs) and rapid expansion from Gulf airlines, leading to very low levels of profitability. Chinese airlines have emerged as the latest threat to Southeast Asian airlines as they expand rapidly and compete aggressively for China-Southeast Asia traffic (there were more than 25 million Chinese visitors to Southeast Asia in 2018) and for sixth freedom traffic to/from Southeast Asia.